Kumistavi cave, also known as the cave of Prometheus. 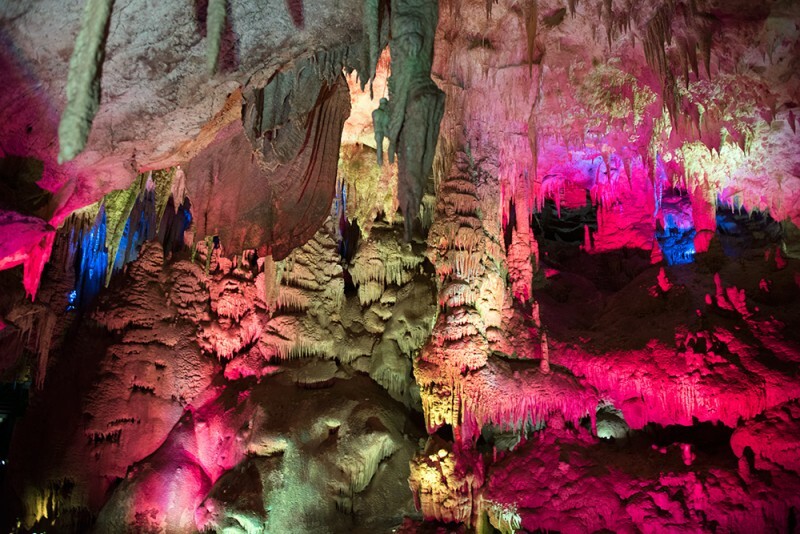 Prometheus Cave is one of Georgia’s natural wonders providing visitors with breathtaking examples of stalactites, stalagmites. Kumistavi (Prometheus) Cave. Kumistavi cave, also known as the cave of Prometheus, is located near the Georgian town of Tskhaltubo, 20 km away from Kutaisi in Imereti region in the West of the country. The cave was discovered in 1984 and was almost immediately developed as a show cave. Kumistavi is the biggest cave in Georgia. Although only one tenth is open for tourists, it takes about an hour to explore it. Inside there are underground lakes and rivers; rather high humidity and a lot of bats, which, however, do not bother tourists, as they fly very high. The cave is one of the most popular destinations in the region, and includes various types of stalactites, stalagmites, curtains, petrified waterfalls, underground rivers, and lakes. Each cave in the cluster of six differs significantly from each other in scale and the unique shapes of petrified flowstones found within. Here you will also have a chance take a boat tour though an underground lake. “Prometheus” cave is one of the richest caves of Europe. It is characterized by the variety of underground rivers and beautiful landscapes. Golden Fleece cave meets all needs of international tourism level. Walking route for tourists is 1060 m. Also tourist will sail by boats in underground lake (280m) In nearby territories where there are other caves speleological tours can be organized. The total length of these caves is 15 555 m.
There is a worldwide known legend of Prometheus, who stole fire from the gods, for which he was punished and chained to Khvamli Mountain, which can be seen from Prometheus Cave, one of the most adventurous places in Georgia. We may not believe in legends, but we definitely believe in a beauty of Prometheus cave.